The forty-first episode of Sledge Hammer was titled Here’s To You, Mrs Hammer and was the nineteenth and final episode of the show’s second season. Sledge suffers an emotional blow as his best friend from High School prepares to marry the former Mrs Hammer. In this podcast Gerry and Iain look at some soul searching for Hammer and a dramatic conclusion to the series. During an interrogation, Hammer is surprised when a suspect’s lawyer turns out to be his old friend Scott Grable (Michael Kaufman) who turns out to be a formidable legal opponent. The pair become reacquainted and spend some time together looking back on the old days. A dramatic twist follows when it transpires Grable is engaged to be married to Sledge’s ex-wife, Susan Hilton (Heather Lupton, married to David Rasche in real life!). This prompts some serious soul-searching for Hammer and, ultimately, a significant emotional development. Christopher Jackson also appears as Grable’s client. The episode was directed by Bill Bixby in the last of his eight episodes, with writing credits going to long-time contributors Mert Rich and Brian Pollack. 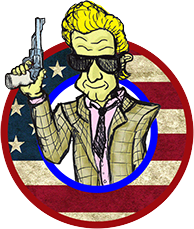 If you have thoughts on any aspect of Here’s To You, Mrs Hammer please share them below, or find us on Twitter at @sledgecast. 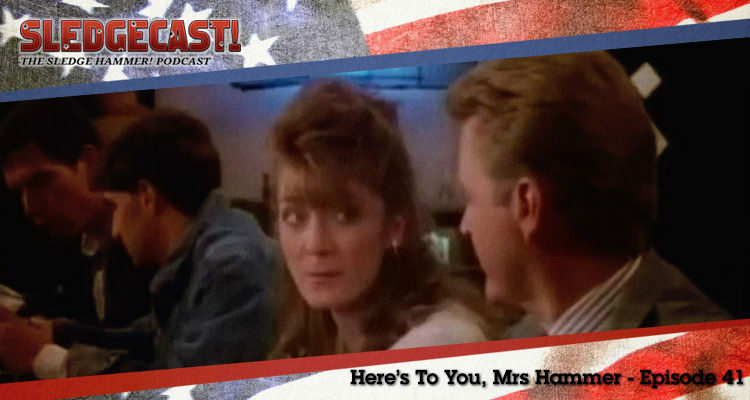 Here’s To You, Mrs Hammer was released in 1988. It is 30 minutes long and originally aired on the ABC network. This episode is available on the Sledge Hammer DVD box set from Laser Paradise (German/English language) in Region 2 and from Image Entertainment in Region 1 (USA).